I had to take it in an acoustic guitar gigbag, because I still haven't found a case big enough for it. The head stock was poking out the top with a hand towel wrapped around it. I contacted a music shop twice, but the supplier's still haven't got back to them about the length of their case. Hmm. When I got there, people were pretty interested in it. The other bass player, Rick, had a quick go unplugged and commented on the strings and just how low the action is and how easy it feels to play. He didn't play it properly though because it he said it has too many string and would confuse him. LOL. Yeah I know that feeling. I jumped in about halfway through the night. I guess the first thing I noticed was the radical difference in EQ needed for the bass as opposed to the Tune WB4 Rick uses. He's also using LaBella tapewounds, although his are black tape. He had the bass and high mids wound out. The 6 string sounded a lot better set flat. I was plugged into his AER Amp One. A crazy little amp that produces some amazing sounds for it's size. The 6 string sounded pretty enormous through it and everyone there commented on how good it sounded. It took me a bit to get it like I wanted. In the end, I had a touch of piezo, but mostly mag PUs. I've always liked the look of his Tune, but found it sounded sort of squidgy and rubbery. My bass didn't sound anything like that. A lot more articulate. The upper registers are also a lot more even and clear. Even high up on the C string it cuts. What did surprise me is how polite the front of the note is. I guess I was expecting a bit more thump ala upright. It doesn't really do that without right hand muting and playing with your thumb. If you do mute, the thump is huge, but otherwise it's uber smooth. I guess some big nasty flatwounds might do that, but no one makes them for a 39 scale". Serves me right. LOL. I may let a little more relief back into the neck to bring the action up and give me some thump... or not. It's pretty sweet to play. Which brings me the next thing. The scale length is much more akin to upright than electric in many ways. It's a struggle to play across 4 fingers below about the 6th fret position. Additionally, get to "farmer's corner" requires a serious stretch. I found myself playing a lot of low F's on the B string. Getting down low comfortably involved pulling the bass to my right, across my body, so the 24th fret position was beyond the middle of my torso. It's not heavy, but it is huge and you have to find a comfy way to reach the lower notes. I guess the biggest issue, and I knew it would be, was intonation. There were a few times when I just couldn't quite get in tune properly. "Outta Nowhere" was probably the one where I consistently struggled to find the sweet spot, even though the chords weren't particularly difficult. I had to sight transpose "fly me to the moon" up a full tone (step) and really that wasn't all that bad considering it was a new instrument with no markings. Strangely, taking solos was less of an issue than I thought it might be. Sure, there were a few off notes, but mostly, I just closed me eyes and tried to sing along with it. Not worrying about where the notes were, just playing them. Mostly, that seemed to work. So maybe I need to do that down lower. Course I think the reason that worked was because up higher on the board, you can play in 4 finger positions and it's a little more secure. What I came home realizing was I need to do some scales and find my patterns down low on the board. It's not impossible, but it will take some work. As I mentioned before, there are no dot markers. To be honest though, I'm in two minds as to whether they might have helped me last night or not. By the end of an hour, my fore arms were pretty sore. I went indoor rock climbing (my preferred exercise apart from walking) for the first time in three months on Tuesday. So yesterday, my forearms were pretty sore before I got there. I purposely didn't take a guitar, because I knew bar chords would do me in. Overall, the bass was pretty kind to me. It doesn't require a lot of pressure. The neck profile is very flat, almost fence paling. That's been stretching my left thumb over the last few days and it was a little sore, but last night, it was fine. So maybe I'm just getting used to a different shape. Certainly standing and playing seems more comfy than sitting as far as my thumb goes. I guess time will tell. At this point, I think if I was to start over again, I might drop the scale length back to 36-37 inches. But then I've never really played a bass that big. So it might be as bad as 39". The sound is not exactly what I was aiming for, but I can feel vibrations resonating through the upper body, even when unplugged. So the body is definitely effecting the sound. The overall sound is extremely rich with overtones. And it's a very organic sound too. Just not sure how much the structure is changing things. That was one of my fears with mag PUs. They really have a sound of their own. Anyhow, I'll keep playing it and do another report down the track. I have noticed one issue with buzzing/humming. It's not terrible, but I might have to shield the back of the pickups somehow. I think I'd likely build it with just one PU next time. I think 2 are effecting the piezo in ways I hadn't anticipated. Which is a bit of a shame. The extra PU allows me to get that Jaco tone, but I never used it last night anyway. I've tried playing "Jerry was a racecar driver" and "Tommy the cat" (by Primus), but I can't pull either off properly yet. It might even be a bit big for that. Ridiculous eh? Seriously though, it's bananas - 6 strings and no dot helpers is a recipe for disaster in my hands, add an unfamiliar scale length on top and I'm done. In my mind, it's a great experiment on its own but the truly impressive part is how quickly your playing style adjusted to it. Anyway, I've thoroughly enjoyed this build - it's a great outcome, congratulations! Thanks, I guess the long term outcome is whether it sees a lot of action. I played it again this morning and I'm getting better. I just need to go back to my upright roots and really listen. Playing off open strings to make sure I'm in tune is important too. One of the guys last night said it's big enough to put an endpin on and play upright. He's probably correct, but for now I'll stick with it as is. You asked for a comparison pic. The green bass is 32", but with the monster headstock and the offset body, it's not that much shorter than a P.
That doesn't really show the difference in playing position though. So here's a gif of me in all my glory. Bluesteel! You can see how further apart my arms end up. Also how much lower it sits with the neck at the same level. The end of the bolt on headstock is level with the first fret position. That was a deliberate effort to get F and Bb in tune. We'll see if it works, but the headstock doesn't get in the way at all. I also realised I could pack the whole thing down to 80cm if I needed to transport it, which is pretty cool. This came together nicely and by the sounds of it (pun) it sounds pretty good too. That's what you want. Interesting to see that (apart from the obvious differences to a "standard build") you went with a much (according to you) shallower neck profile, and you like it. I think that is one of the keys to playability in a 6-string: keep it thin, and the width becomes less of an issue. You could have saved a little bit in body mass by moving the bridge closer to the tuners (the other way round, actually) saving weight and bringing the money-making part of the board closer to your body. But hey, I'm nitpicking of course - great job, and I'm sure you'll get plenty more comments (interestingly I haven't had ANY comments on my blue neck bass). Thanks for the kind words. You're right, the neck is much thinner. I think it's a toss up though, to be honest. I would have liked narrower spacing, but I was stuck with the tailpiece spacing from 5 years ago when I ordered. But it is nice to play up in the upper registers. I'll build another 6 string soon enough. That will have much narrower spacing. Re the bridge, I was trying to keep the break angle to 14deg. Additionally, if I put the bridge too close to the tailpiece, it would increase the stiff of the body. When I was specifically looking to take advantage of having the whole body flex and work more. I don't know if you noticed, but I moved the strap button onto the back to locate it better when playing. That also worked out really well. P.s. if you like those shorts, you should see the light blue Hawaiian pair I have. My wife hates them. My brother asked if my husband had given me permission to buy them. Hence they're now called the "husband shorts". Thanks! I'm surprised, it actually looks more comfortable on your frame than the 32". Yeah, the strap was a bit short on the bird. My son was using it the other day. Otherwise it's a super comfy thing. I can understand your comments re fretless. I guess I was having on of those moments during "Outta Nowhere". You can kind of will yourself out of tune, like trying too hard to balance on a pushbike. I think the trick is lots of practice and really feeling at home on the instrument, as well as being able to hear yourself properly. Years ago I was asked to dep for a visiting artist at Hillsong Conference. 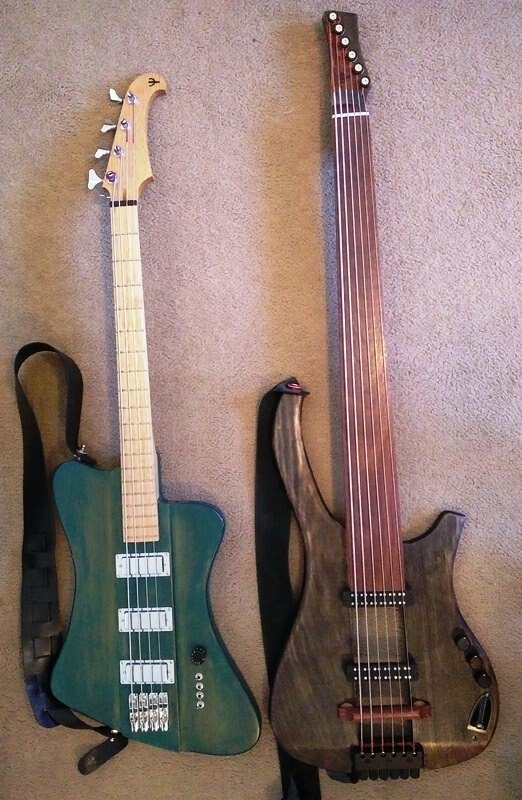 It was a week after I'd got my TRB 5 string fretless. Turned out the guy leading the band had perfect pitch (which I consider BS) and was super picky during rehearsal. When we got to the church auditorium, the fold back quad wasn't working. The only bass I could hear was the occasional high note coming off the back wall, along with a little sub. So here was I, brand new bass and no way of hearing what I was doing properly. Sure it had fret lines, but that's no measure. Once the performance was over, I ran for the hills. 1. Some dot markers. I realized yesterday I'm just making life hard for myself in that regard. I've got some tiny plastic rod I'll use. So it'll be really subtle, but help me to get in the right place faster. It'll also help others who want to try the bass not feel so at sea. 2. A push/switch pot to disengage the piezo from the mag PUs. There's some weird cancellation going on their with them that wasn't there with them on their own. So I've just got figure out where to buy of the said pots. Nothing wrong with markers at all. And those pots are “perfect for guitar mods” so you’re not their intended buyer in the first place. And , they’re a little too deep ... .
Serious suggestion: can you do this with a mini switch? There's no room for a mini switch sadly. Beyond that, I do have some options for the buffering circuit. I'll try that first.